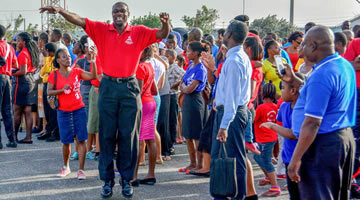 The South Caribbean Conference is one of two Adventist organizations in the Republic of Trinidad and Tobago. The Tobago Mission oversees the work of the church in our sister isle. The South Caribbean Conference serves the island of Trinidad, part of the twin island republic of Trinidad and Tobago. The conference is responsible for 116 churches with a membership of over 52,000 and growing. The South Caribbean Conference of Seventh-day Adventists, under the influence of the Holy Spirit, exists to provide leadership, empowerment and hope to its members, equipping them to proclaim the everlasting gospel to all peoples in the territory of Trinidad. Every member of the body of Christ, living in readiness for the kingdom of God. Reliance on God, integrity, respect, glory to God, Godly lifestyle, excellence and humility, compassion, fairness, commitment, unity, loyalty and fidelity. We invite you to discover more about our faith globally and the work of the Adventist church in Trinidad. The South Caribbean Conference has its genesis in the West Indies Union Conference which was established in 1906. The work of Adventism in the Caribbean started in the island of Jamaica and spread south rapidly. By early 1916, it became clear that the South Caribbean Conference was now ready to become a conference and was thus established. From its humble beginning of 9 churches and 348 members we have grown to over 100 churches and 40'000 members. In 1927, the East Caribbean Training College began operations with the aim of preparing young men and women in service to God and for humanity. It was the first tertiary education institution in Trinidad and Tobago. Today, it is now known as the University of the Southern Caribbean. Initially the conference consisted of all the islands of the southern Caribbean, from Barbados southwards. Barbados and St. Lucia aligned with the Leeward Islands Conference from the South Caribbean Conference on January 1, 1930, leaving the South Caribbean Conference territories as Grenada, St.Vincent and Trinidad and Tobago. St. Vincent and the Grenadines were aligned with the East Caribbean Conference from the South Caribbean Conference on January 1, 1976. Grenada became an Administrative unit of the East Caribbean Conference, January 1, 1981. Grenada organized as a Mission - January 19, 1983, while Tobago was organized as a mission in 2004. For those interested in knowing more about the work of Adventism in the southern Caribbean the book A history of the Seventh-day Adventist Church in Trinidad and Tobago, 1891-1981, by Eric John Murray is an excellent resource.